I don't know how to explain that I know his heart better than anyone's, and he mine. There is so much to love about this book. And I will not talk about all the reasons for why I love it. Just a few main parts, to let you know how much this book means to me. Because it means pretty much everything. The Scorpio Races is full of feelings. There is so much heartbreak. There is so much hope and happiness. Mostly there are sad parts. But it is all so real and honest and I love every moment of every thing. Sean and Corr means the world to me. And Sean and Puck are just the sweetest thing. If I were to describe The Scorpio Races I would say it is a book about Sean and Corr and Puck and Dove. About their love for Thisby, the island. About their love for the water horses. About their growing relationship. About their lives, and how they want them to get better. To me, The Scorpio Races is everything. It is so well done. I cared for the characters so much. I wanted all the things for them. And I never wanted this book to end. But it do. And the ending is the best. But I still wanted a bit more, hih. all the feelings you liked, so long as you weren't hurting the feelings of a Connolly. There are two point of views in this book. First there is Kate Connolly, who likes to be called Puck. And she is all kinds of amazing. I adored reading about her. I adore her horse, Dove. I adore her younger brother, Finn. I wanted to know more about him. But her older brother, Gabe. Sigh. I hated him. I have hated him since I first read this book, and I still do. He is leaving them all alone. And I will never forgive that. Sure, there is a reason, but I don't approve of it either way. Anyway. I did love reading about them. Then there is Sean Kendrick. Sigh. My love for Sean is the biggest. I loved reading about his life. How he lost his dad and his mom. How he works for Malvern, whom I despise. And Malvern's son, Mutt. He is the character I hate the most. Just. Awful person. But so awesome to read about at the same time. The story is just all kinds of amazing. But Sean. I love how everyone looks up to him, though he's only nineteen. I love how he is with the horses, how much he loves them all. Sean is the best person there is. This book is about horses. And though I don't like horses, I loved them in this book. So so much. There is just so much about them. The water horses. But also the normal horse, Dove. This book made me love them. Okay, Sean made me love them all. Especially Corr. And the relationship Sean and Corr have. It is the most amazing. And I am dying to read more about it. There is a race at the end of the book. It is so exciting. Yet it is the most heartbreaking thing and I cry every time I read it. Sobs. Damn it. I have already said too much about this book, I think. It's just. When I start thinking and writing about The Scorpio Races I cannot stop. I have so much love for this book. It means the world to me. Sean is the best. And the small romance between Sean and Puck is the best thing in the world. They are perfect together. And I adored reading about the American, George Holly. I just loved every single thing about this book. And I wish with all my heart that there will be more of it. I can't stand not knowing more. If you still haven't read The Scorpio Races, then we cannot be friends. Because this is the most stunning book. And I have been talking about it for years. And you need to have read it by now. Okay, I will give you a chance if you read it right away. 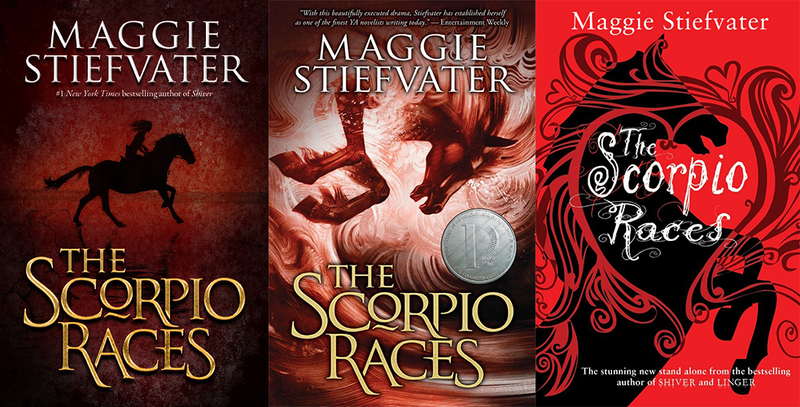 <3 Because no one should live without having read The Scorpio Races. Without having met Sean Kendrick. And Puck Connolly. And Corr and Dove. And just everyone and everything. This book is stunning. And you all better have read it by now. Because this book is the best. She stands beside Corr, looking up at him. I want her to love him. Goodreads. Maggie Stiefvater. The Book Depository. The Raven Boys. The Dream Thieves. Blue Lily, Lily Blue. Shiver. Linger. Forever. Sinner. Old The Scorpio Races Blog Post. I hadn't read this book until this fall, and I started out with the audiobook. It was a big mistake, because the narrator who read from Puck's point of view made me hate Puck almost instantly. Once I switched over to a physical copy of the book, I started to really fall in love with her. I definitely want to re-read the whole book at some point in the near-ish future. I really NEED to read this book! Coming so highly recommended from you and also being a Maggie book, I must read it soon! This is one book that I still haven't read *hangs head in shame*, but from your review alone I can see why I need to give this book a go soon. Stiefvater's world and writing sound absolutely beautiful! Still haven't read this one. I think it's borderline MG/YA isn't it? I've heard AMAZING things about Maggie Stiefvater's books and from your amazing review, I definitely think I should start reading her books! I love it when we fall so in love with a book and the characters feel like our best friends, it's one of the best feelings ever. Will definitely try reading this soon! Maggie S has been known to say she like to make readers cry---LOL, I guess she did a good job with this one! I love to hear your excitement for this one, Carina! I'll have to read it sometime soon. After falling with The Raven Boys this year, I'm definitely going to check out this book as soon as possible! You are making me tear up now! What a beautiful ode to an incredible story. And I LOVE those covers above. I nee to get some of the other editions. Where is the one on the far right from? I love rereading favorites - you make me want to pick this one up again!